To some, living as a foreigner in Cartagena de Indias may seem like permanent vacation: living five minutes from the beach, exploring centuries-old churches and historic landmarks, dancing to live music in a plaza lit by candles at dusk. Yes, this is everyday life here and in many ways, it’s like living anywhere. You get used to things as they are. You shop at the same stores. You stop and say hello to friends on the street. You make repeat visits to the same juice place. Yet somehow, often, it still feels special. With a currently-limitless deadline in Cartagena, enjoying picturesque sunsets over ancient stone walls and eating handmade arepas con queso from a cart, it is easy to see how not even the smallest detail is taken for granted. Alberto makes the best arepas in Centro! Details like feeling blessed to see the same people each day and being constantly grateful for the diversity that exists. Watching the young people selling coffee who stop and talk with the old men through their fences. Listening to the grandmotherly neighbor who insists on everyone’s clothes on the shared line being hung inside out so they don’t fade. The rotund, smiling lady on the beach, who offers fresh piña samples, even though she knows you have already tasted (twice) what she is offering in her ensalada de fruta. For all these things and more, gratitude for even the smallest of details is plentiful. While Cartagena is starting to feel like home, there is one city to which there will always be a connection: Charleston, SC, where I lived as a young girl. Often, it seems the similarities in Cartagena and Charleston are part of what enticed me to move here in January 2015. Gorgeous colors of.. Charleston? No… Cartagena! 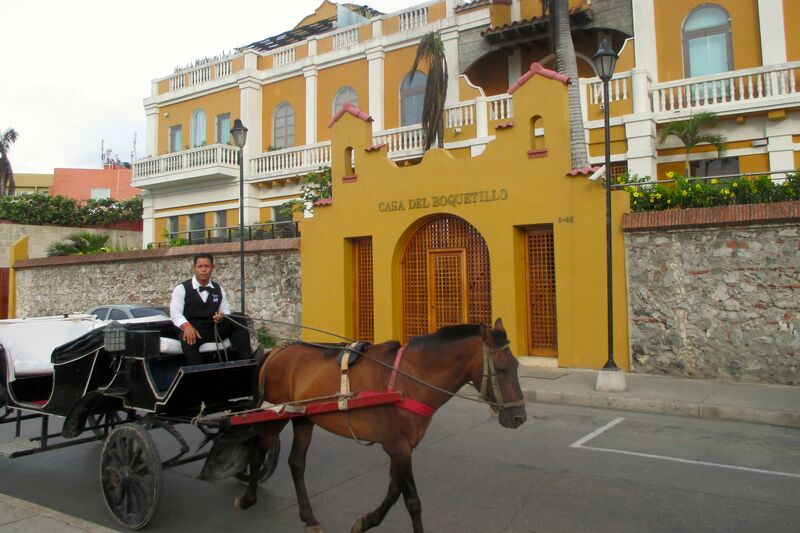 Both cities have a colorful, colonial downtown with a dark, historic battle-torn wall and horse-drawn carriages still making the rounds on cobblestone streets. Both also rely (and thrive) heavily on tourism, and both are notorious for their sweltering heat and humidity. Sometimes, at the sound of a coche passing, I close my eyes and rapidly open them to wonder, momentarily, in which city I am living. For this, it is both ironic and devastating that, while I cheered on Colombia in their first Copa América victory over Brasil, nine people were killed in the American Methodist Episcopalian church in Charleston. Innocent victims, who had gathered for bible study, gunned down by a terrifying racist with no remorse. While one side of my heart was swelling with pride from a well-earned victory, the other side was aching with pain for the families of a loving community. Living as an extranjera in Colombia for the past year-and-a-half, I have endured plenty of full-on stares, inappropriate questions, and the occasional “invisible” treatment. But I’ve never felt segregated because of the color of my skin. It seems that every person here is every color, meaning it is hard to tell where one color ends and the other begins. My friend Gis has rich, creamy dark brown skin. His brother Tomás, born of the same parents, has light, milky-beige skin with tan freckles. Both are beautiful in their own way and, still, they look nothing alike. Yet they are born of the same blood. As we all are… somewhere…deep down. We all exist the same in this world, together, even if we’re born looking very different for one another. I haven’t lived full-time in the US for a few years. Reading news headlines and listening to responses to the shooting, I felt helpless living abroad, far away in a seemingly-twin sister city. Hearing about the week’s events, thinking of the senseless hatred from one terrible person that took the lives of nine beloved others, there was nothing to do but pray. But while it seems just one act of violence can undo years of progress and change, the people of Charleston are proving that this is not something that will tear them apart. They are rallying together to fight hatred; some are even forgiving the shooter and moving on. As my upcoming travels take me flying at the same hour of the Copa América game between Colombia and Perú, my heart will definitely be in two places: up in the air with my seleccíon, and soaring among angels from American Methodist Episcopalian. I love this post; so much warmth and very thought provoking. Beautiful description of Sister Cities and amazing people! Gracias, Valerie! I hope you will visit both cities and me some day soon. Gracias amiga, Myriam! Nos vemos pronto por un abrazo fuerte.